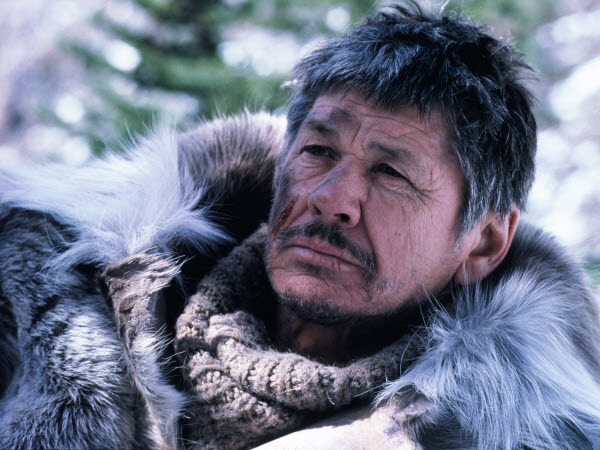 Based on the Canadian manhunt of Albert Johnson in the northern tundra this film strays quite a ways from reality according to historians. 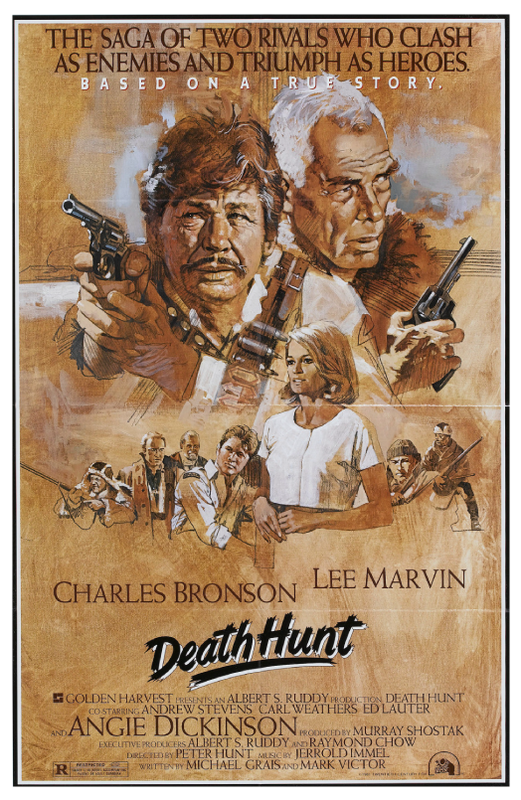 But who cares, because this film delivers the goods that one should expect from a film that teams Lee Marvin and Charles Bronson for the first time since their 1967 appearance together in the box office smash The Dirty Dozen. The sad thing is that the movie never quite caught on with the public. Marvin had pretty much lost his box office pull by this time and Bronson was fading as a major draw at the ticket booths. Marvin is the Mountie and Bronson is the suspected Mad Trapper on the run in the northern Canadian Rockies circa 1931 trying to make his way to Alaska and freedom. 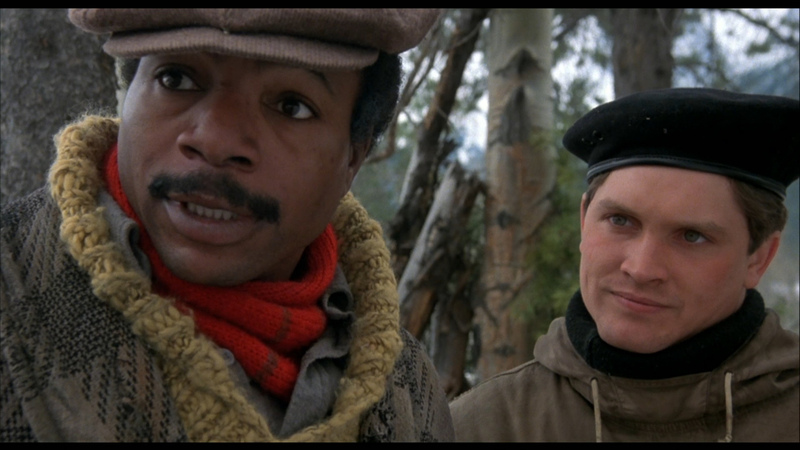 Joining Marvin in the pursuit are 3 actors offering first rate support, Andrew Stevens, Carl Weathers and the recently deceased Ed Lauter. For those that think Weathers could only play Apollo Creed, they need to check him out here as Marvin’s second in command. The film offers a nice contrast of the old Mountie played by Marvin to Stevens as the kid bringing new methods and technology like a 2 way radio into the chase. The location shoot in Northern Alberta is breathtaking at times and the soundtrack perfectly matches the Arctic chase. Rounding out the cast are a slew of unsavory character actors like Maury Chaykin and even Uncle Leo or rather his real name Len Lesser of Seinfeld fame. For the token female role the producers have brought in Angie Dickinson to add a touch of class to a few scenes with Marvin. There appearance together is a reunion of sorts as they previously starred together in a couple of 60’s gangland films. The Killers and Point Blank. The film from director Peter Hunt (On Her Majesty’s Secret Service) is his second with Marvin having previously done Shout at the Devil with him in 1976 and he would go on to do Assassination with Bronson in 1987. Get a copy and check it out. this sounds so cool! never seen it but the cast and the subject matter definitely appeals! I have always been a fan of this one, love the location shooting especially. Still has a western feel to it. I remember being so upset when it came out to the theatre because it was rated R and I couldn’t get in. Had to wait a couple years for the video tape and then going out to rent the machine and 3 movies for a weekend. I must have watched it at least 5 times over those 3 days. Oh well if you like it that much it must be awesome, ahh ye olden days of renting a machine and having to do the Sophie’s Choice of which three movies!! Pray tell was this at Bandito or Jumbo or Steve’s? For us the machine rentals were always at Steve’s at the old location on Lancaster.